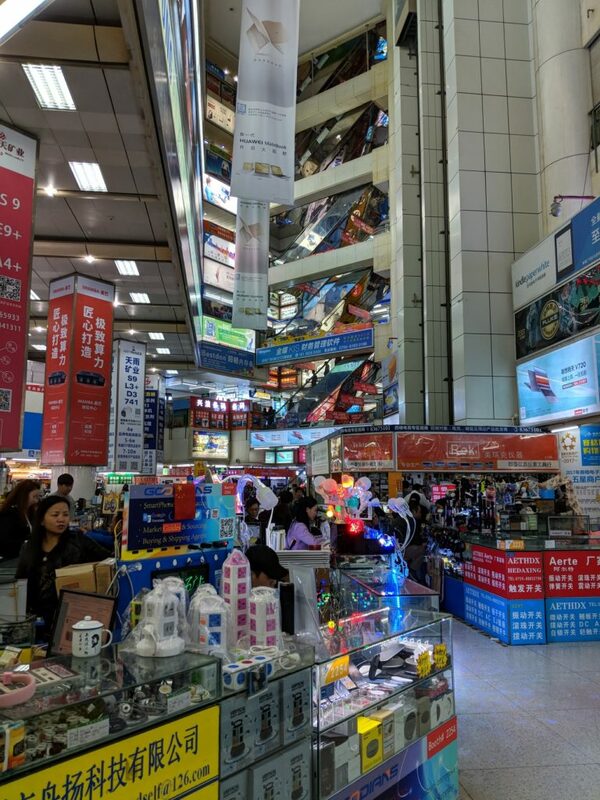 It is likely the world’s largest open market of its kind and surpasses the Akihabara district in Tokyo as the place to go for non-specialty components. 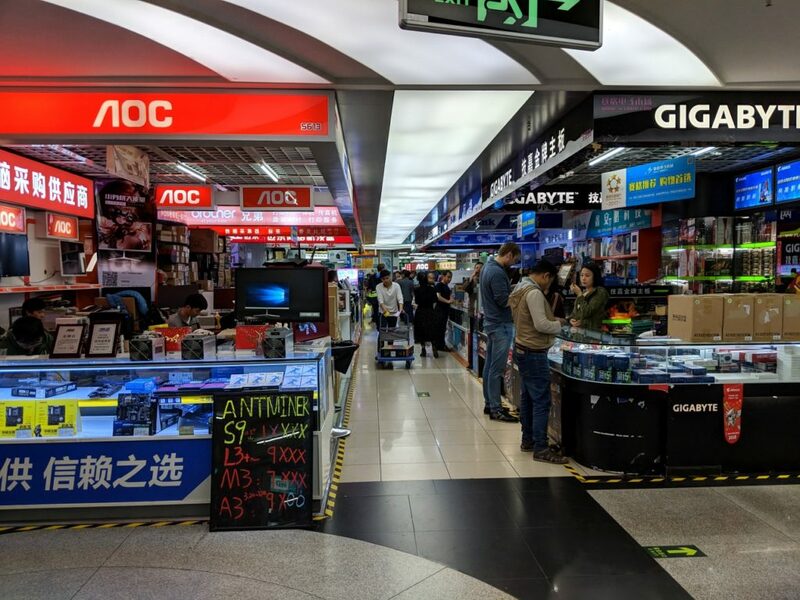 For specialty components (vacuum tubes, perhaps), Akihabara may actually still be worth a look, although really your best bet these days is to check online. The long tail of commerce and interested eyeballs dovetails nicely with the limitless capacity for component databases. The focus of the market is production and wholesale-quantity purchases, but it isn’t clear to me that this is a place where you find long-term, repeatable production capabilities. And it isn’t clear to me how you guarantee the provenance of the goods you are buying. 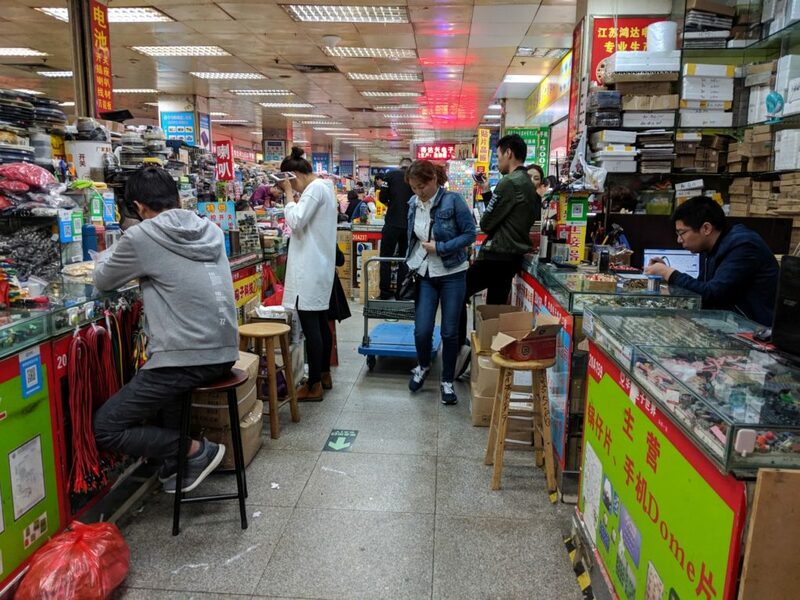 Talking to a colleague of mine who specializes in sourcing and manufacture in China, his belief is that it boils down to the agents you have working for you on the ground. And even then, you might not get what you want, because upstream suppliers can be incredibly fickle. 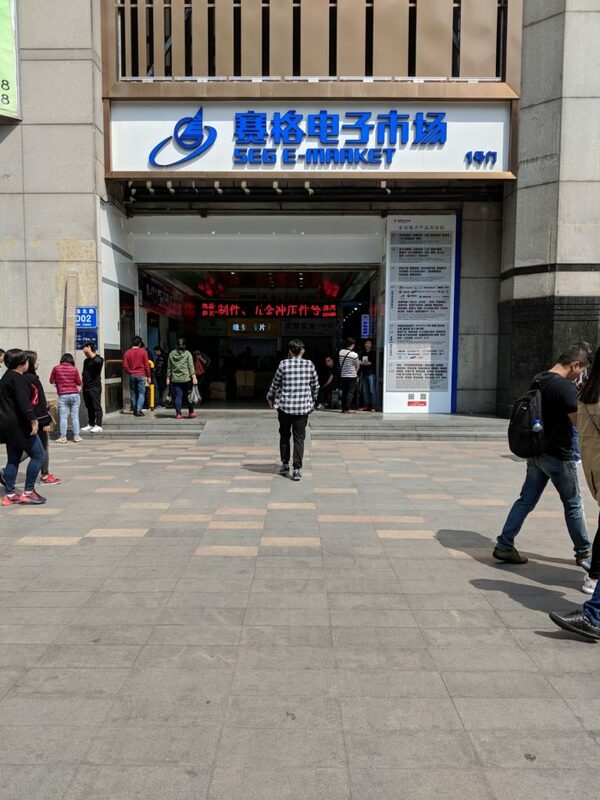 As these suppliers may also demand cash upfront and zero financing terms, and as the rule of law in China as defined by its justice system is weak-recourse at best for foreigners, it’s possible to get stuck holding the bag if the upstream supplier decides that they no longer want to. There were plenty of stalls selling an unbelievable variety of connectors (FPC, FFC, ribbon cables, IDC connectors, Dupont jumpers, and JST XH-style connectors aplenty), the question in my mind as I was looking at this scene was whether you’d be able to get the consistency needed to do a proper production run. – If you needed to place an additional order of the same part in quantity, would that be possible? – What does the supply chain look like, that feeds into HQB? – What kind of Minimum Order Quantities are these vendors looking for? – What kind of Outgoing Quality Control (OQC) do the vendors perform? – What kind of Incoming Quality Control (IQC) do you have to perform on the purchased components? – How does that impact overall product costs? – How might that impact product yield? 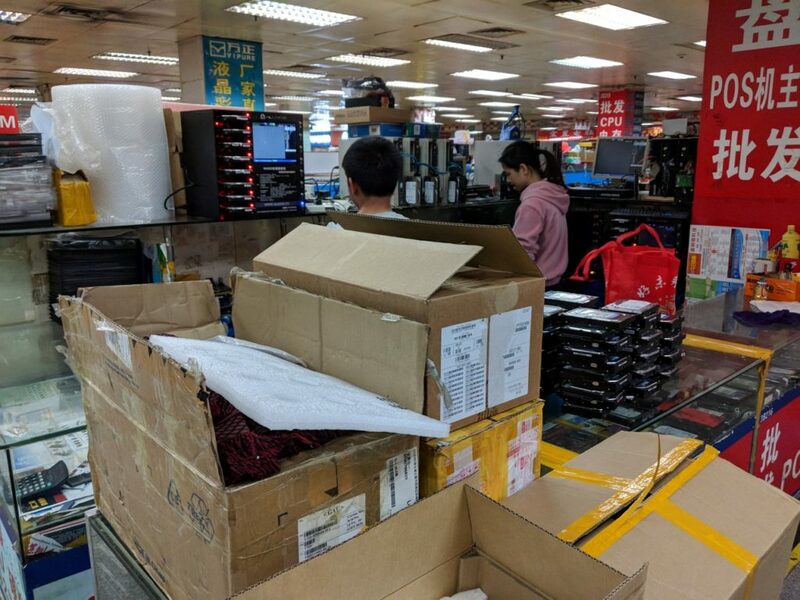 I’m wondering if anyone out there has done a 1000-unit or 10000-unit build of anything using components sourced from Huaqiangbei who could talk about their experience. 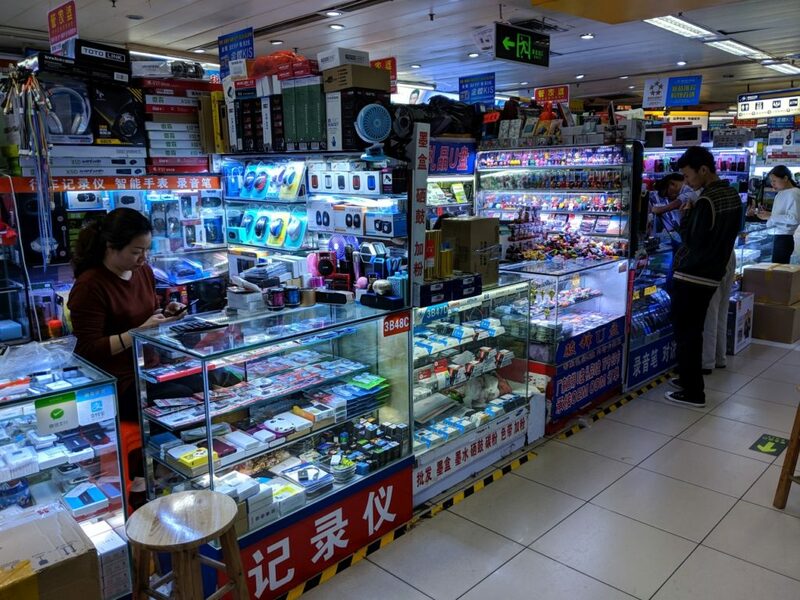 HQB is somewhat related to the Maker scene, but after walking through its thousands of market stalls, I would unfortunately have to categorize its actual innovation capacity as not as high as many others have written. There are plenty of fawning Youtube videos, describing how fascinating HQB is. I think my opinion might differ from many who take a superficial view of the market (mostly thinking about a lot of vloggers out there). But then, my opinion is also not well-informed by people who have a very deep understanding of the market. 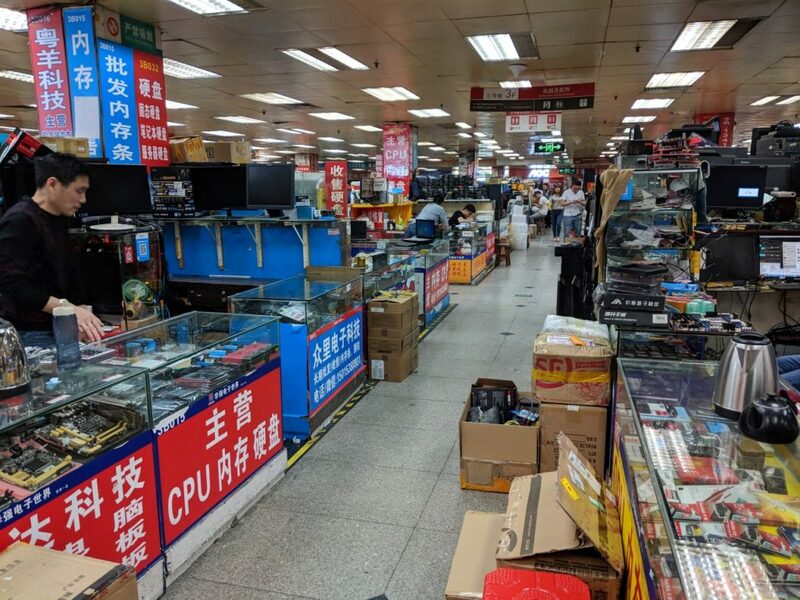 To be sure, there are literal tons of components here to be purchased, in tapes and reels of thousands and millions of pieces, in chip trays, in loose plastic baggies, and bundled together by rubber bands (in the case of many commodity smartphone motherboards and RAM DIMMs). 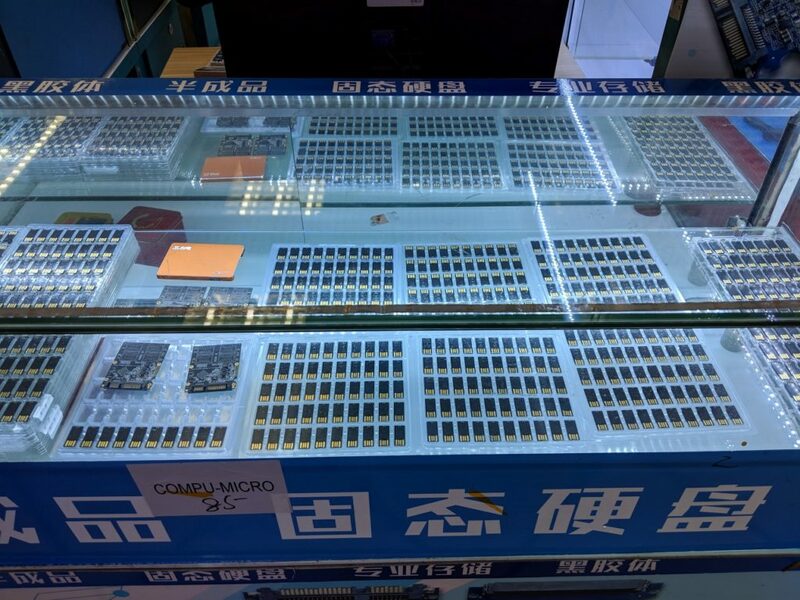 But beyond a scattering of Arduino and the power-hungry and (although-beloved) not particularly well-certified ESP8266 and ESP32 modules, I saw effectively zero evidence of ARM’s low-power microcontrollers in the market. Given the percentage dominance of ARM in the low-power embedded market, this was surprising. 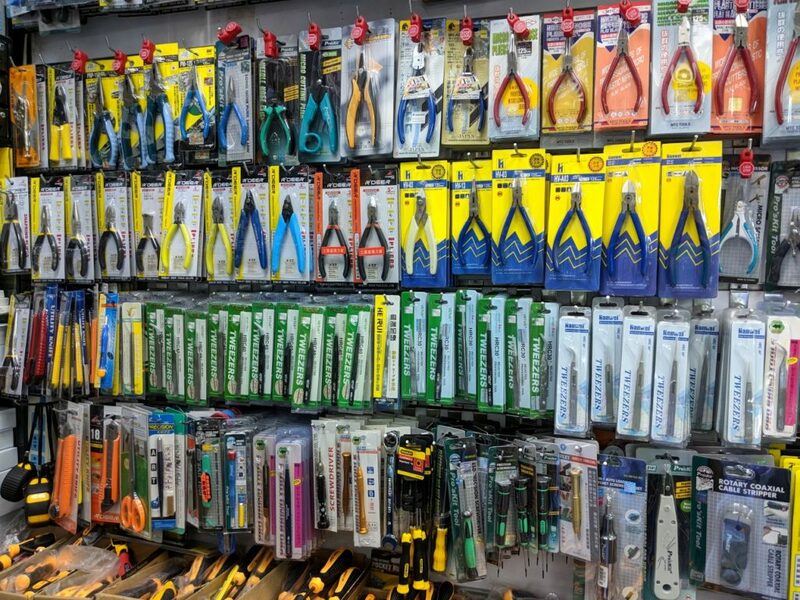 In addition, it wasn’t clear to me that any of the vendors of these Maker tools really knew how they worked or had any interest in teaching people how to use them. Most of these men and women were traders only, and were not particularly interested in how a compute module worked, as long as its margin was good and you were buying a lot. 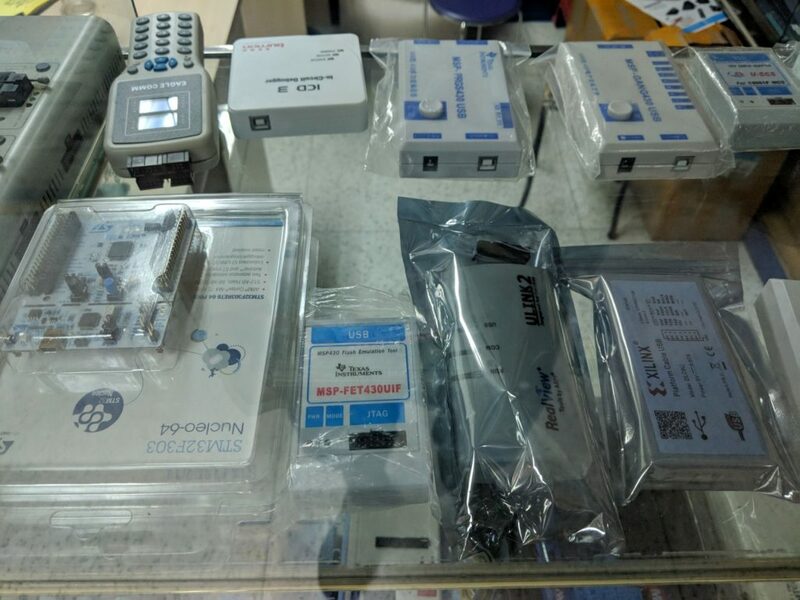 STM, NXP, Silicon Labs, and other Cortex-M derived microcontrollers were conspicuously absent, along with their corresponding programming and development kits. Although I did see numerous Microchip PICkit clone programmers, a handful of STM8/8S programmers, and a rare few TI CC-chip programmers and not really any MSP-chip programmers, I saw few of the actual chips they were meant to work with. I suppose this isn’t too surprising, as at the current time of writing, at street level, Cortex-M microcontrollers aren’t too common in Maker-oriented hardware. And while the Arduino Industrial Complex dominates in terms of volume, in terms of actual suitability for use in mass production, the Atmel chips that drive most Arduino modules couldn’t be farther away from cost-appropriate. Also, the software and hardware drivers behind Arduino’s superloop-based development model tend to have pretty low quality and usually zero power-management capabilities. I weep for anyone trying to develop production-grade goods using an Arduino codebase. Anyways, the types of silicon that I tended to see in display cases in HQB were smaller discrete logic elements like 7400-series chips, FTDI knockoffs, certain automotive transceivers like TDA-series CAN bus drivers, optoisolators, and heaps of three-terminal voltage regulators. Keep in mind that a lot of the display case posters, onto which these chips were mounted, were often pretty dusty or possibly even slightly moldy. For higher-level product designers and human factors pros, I would say that the wide variety of switches, knobs, status lights, injection-molded enclosures, and other mechanical goods are worthwhile to look at if your product needs them. It is very helpful to have dozens of exemplars lined up side-by-side. But again, the reproducibility and structure of the supply chain leaves something to be desired. I’m still not entirely sure how each of these businesses survives, where so many of them seemed to be offering the same products from the biggest manufacturers. 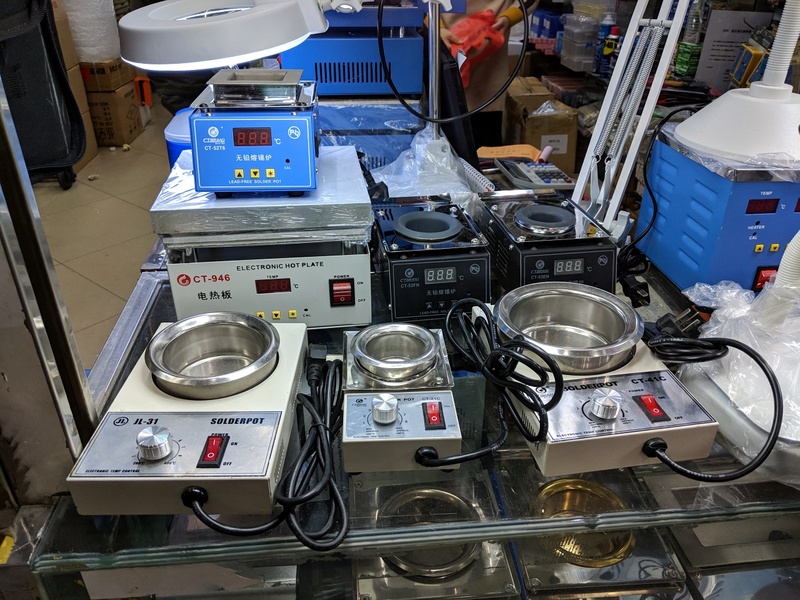 Each business was essentially a miniature distributor, but oftentimes they would specialize on a type of component, be it capacitors, resistors, inductors, or certain active semiconductor components. 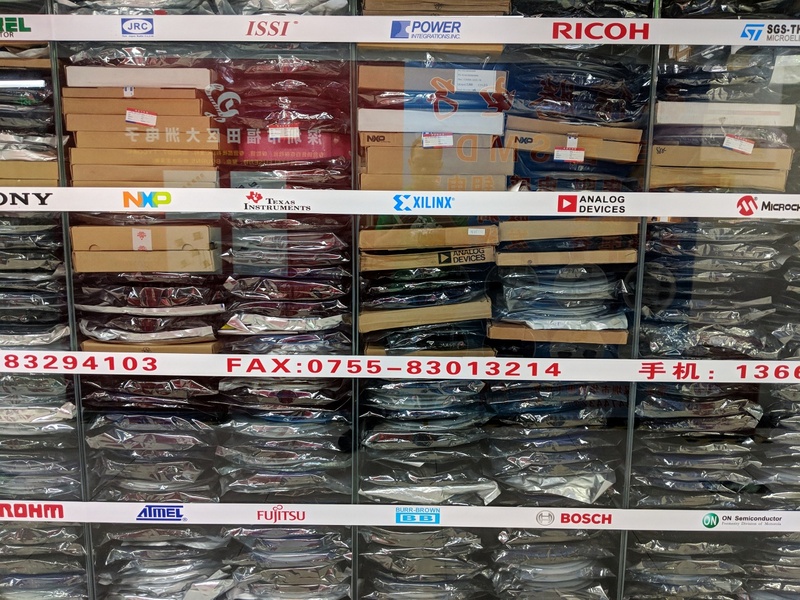 One answer might be the high level of microindustry going on in the market as well, with cable manufacture happening at many of the cable vendors. You would see the people stripping hundreds of 6″ / 15cm coaxial cable segments and then crimping RP-SMA connectors to the ends. This is people power versus machine power, though. As another coworker pointed out, there are machines that do this kind of thing with a multiple-thousand unit per hour throughput rate. 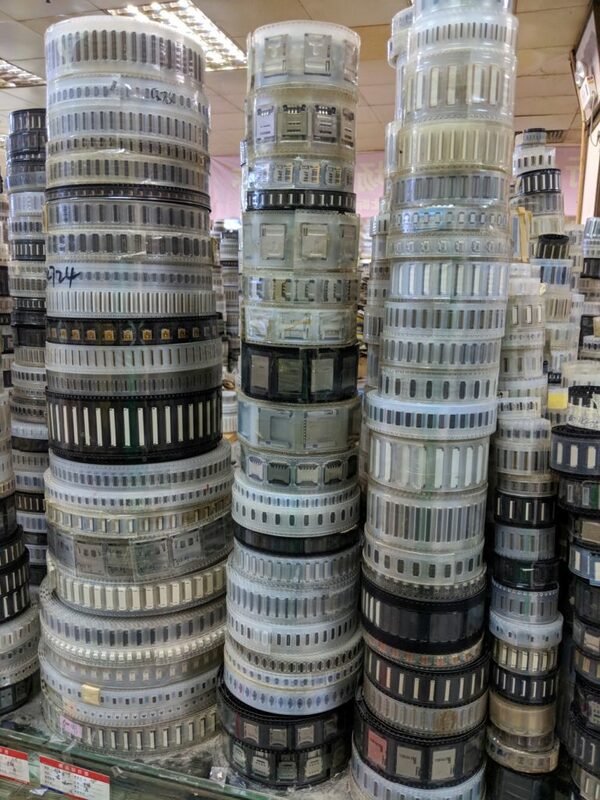 Still, it’s impressive to see piles of ready-to-use cables. On the physical toolkit front, the mechanical tools available were of varying quality, and not too different than the sorts of tools you find bulk-imported on eBay or Aliexpress. Some of the tools had less-than-perfect finish, others could have been destined for export markets in Japan. Indeed, much of the packaging would indicate that the goods were made in Japan, but I had my doubts. 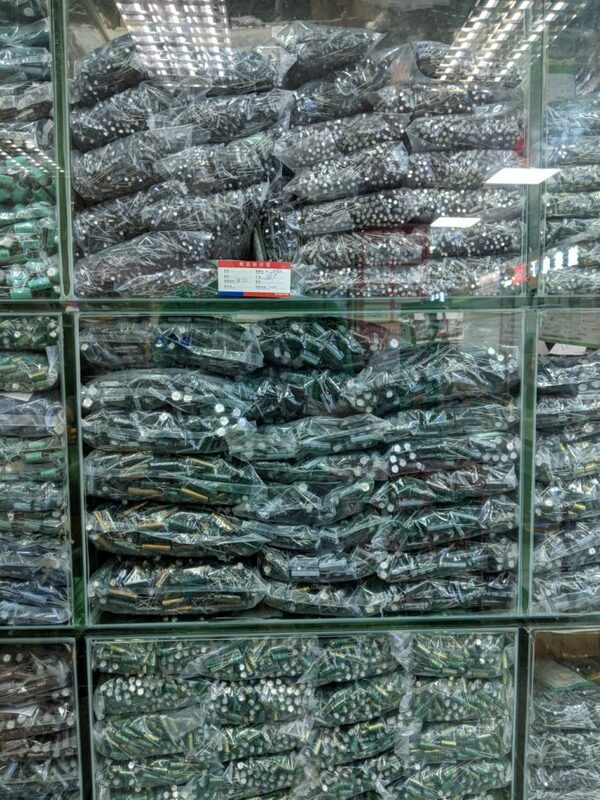 All I could do was inspect the items as closely as I could, and buy the ones with the finest degree of polish. 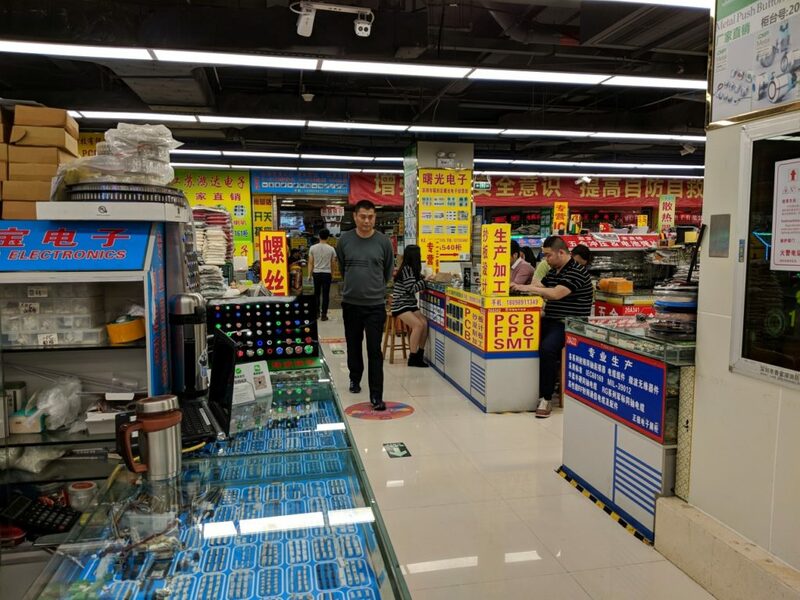 I ended up buying a pair of needle-nose pliers for 45 RMB (about 6 EUR), which isn’t actually cheap, but then I also didn’t bargain with the shopkeeper. 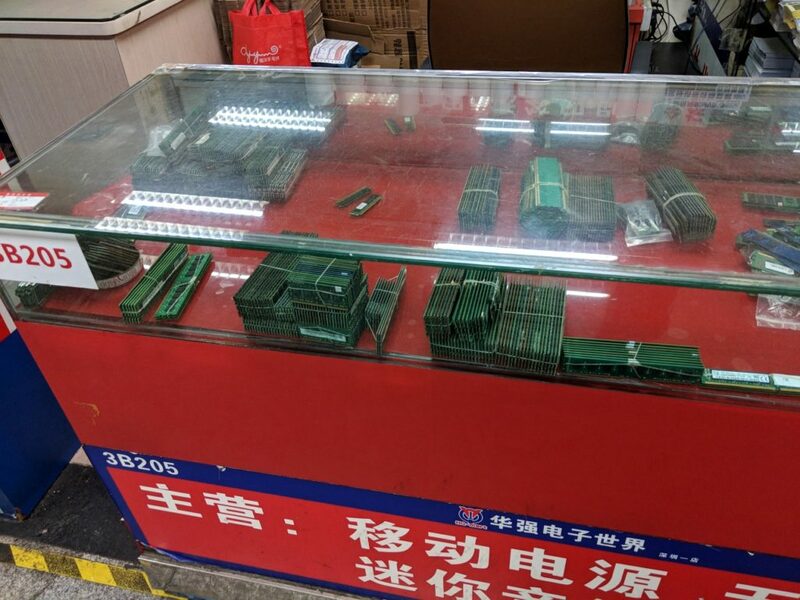 There were also more specialized tools, such as solder pots and binocular microscopes for electronic circuit repair and circuit rework. These were pretty cool things to see. Now, if you go to HQB as a “Maker” or developer working on single development systems or a small batch of product, HQB is actually not the greatest place to get ARM-based development equipment. 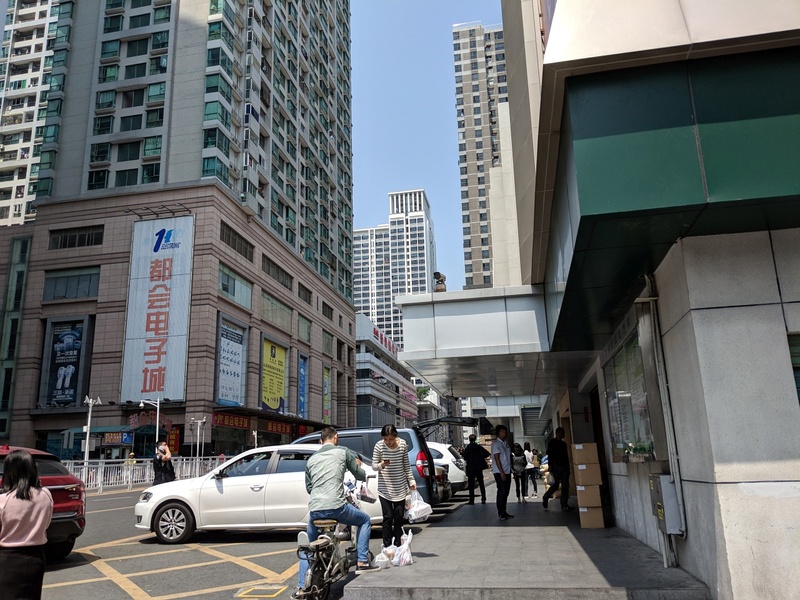 In fact, a few days earlier, I had given my ARM Cortex-M 10-pin 1.27mm SWD programming cable to one of the companies I was visiting on this trip, and was wholly unsuccessful in procuring a new one after exhaustively searching all of HQB for a new one. 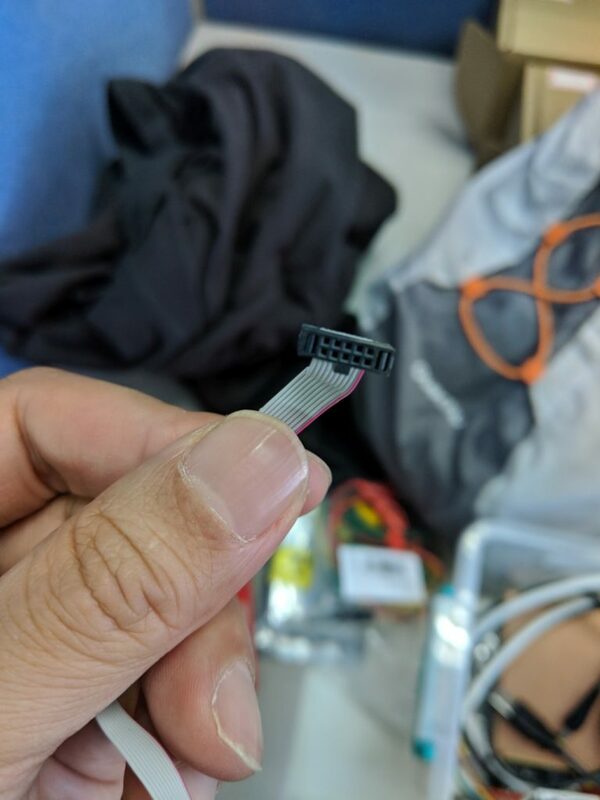 Oddly enough, another piece of evidence I gathered that innovation seemed to move less rapidly here at the street level was the fact that none of the electronics engineers I talked to at the supplier I visited had ever even seen this type of SWD cable or connector before. A fact that I found utterly stunning. What it told me was this: These guys have never developed software on this entire category of common, modern, low-power microcontrollers. Even when talking about production tooling using the SWD debug protocols, no dice, they’d never seen or used it before. With respect to getting this cable, I’m pretty sure that if I had wanted 1000 of them, someone would be willing to make them for me. But in single units, unless it’s a commodity consumer cable, like a mini or micro-USB cable, or Apple Lightning cable, or USB-C cable, or unless it’s a cable they’ve already manufactured a bunch of: there is little chance you’ll get one in single quantities. Note: I did pick up 10x Lighting cables and 10x micro-USB cables for a grand total of 8 EUR, so there’s that. Coming back to that SWD cable, one of the vendors I spoke to had only one question for me, how many did I want to buy? When I said “one”, her interest immediately evaporated, although I was the only customer standing in front of her booth at that immediate moment. There was zero interest in learning what the cable was for, or why it was so important to me. Or why it might be useful to others involved in embedded systems development. Clearly, I was a developer of some kind, with a custom prototype, asking questions. Not having that cable made the difference between me being able to hack on one of my Cortex-M based prototypes, or not, while on my trip. So it was of immediate concern for me. 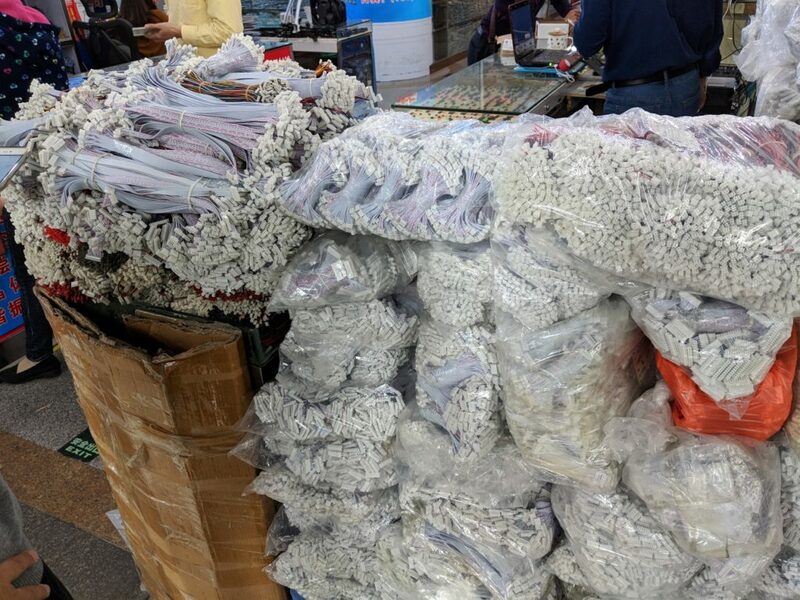 On the other hand, another vendor in a different section of the building went out of her way to try to explain to me who I might be able to talk to do get these thousand cables made. She jumped into a web translation system to go back and forth with me on how this might be done, as my Chinese language skills are atrociously inadequate. So your mileage will vary, according to the moods of the vendors you are working with. What happened to the Shanzhai phones? 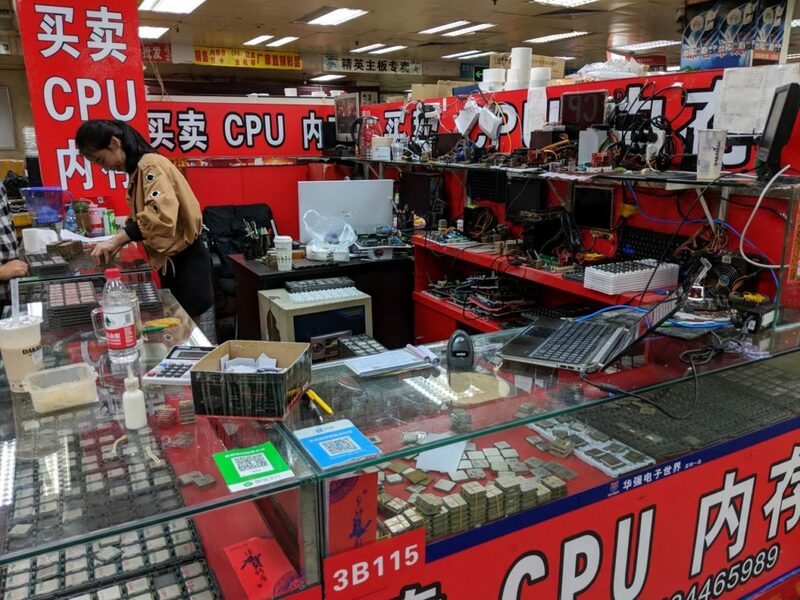 In his seminal book on open source electronics culture “The Hardware Hacker: Adventures in Making and Breaking Hardware“, Andrew “Bunnie” Huang talked about a culture of open-hardware makers in Shenzhen, who were able to cobble together new phones and phone styles from the widely-available, dubiously-sourced parts in Huaqiangbei. These phones (usually feature phones, without touchscreens, etc.) 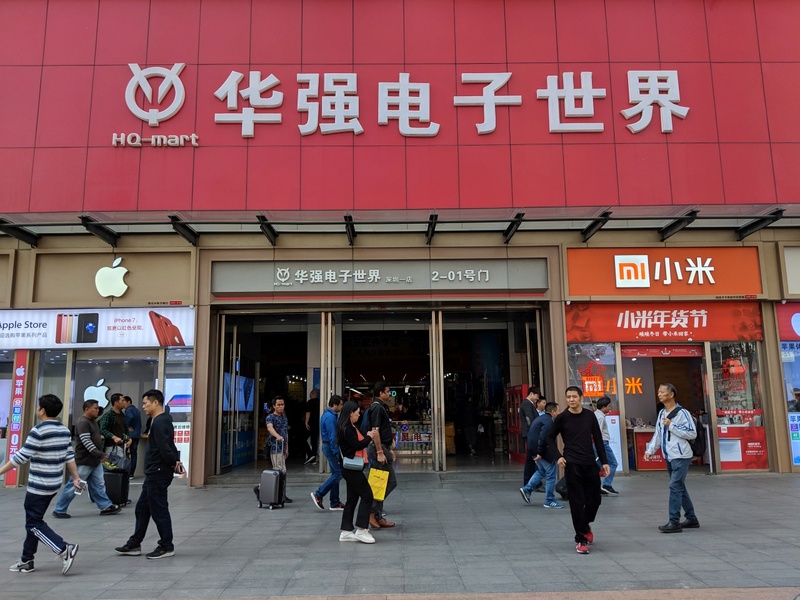 were known as Shanzhai (“Copycat”) phones. Sadly, these phones seemed to be almost-entirely absent from HQB. The convergence of the entire consuming public around the smartphone form factor has all but killed the diversity of these offerings. I went looking, and the closest thing I could find was a feature phone that looked like a racecar. I didn’t even think this warranted a photo. 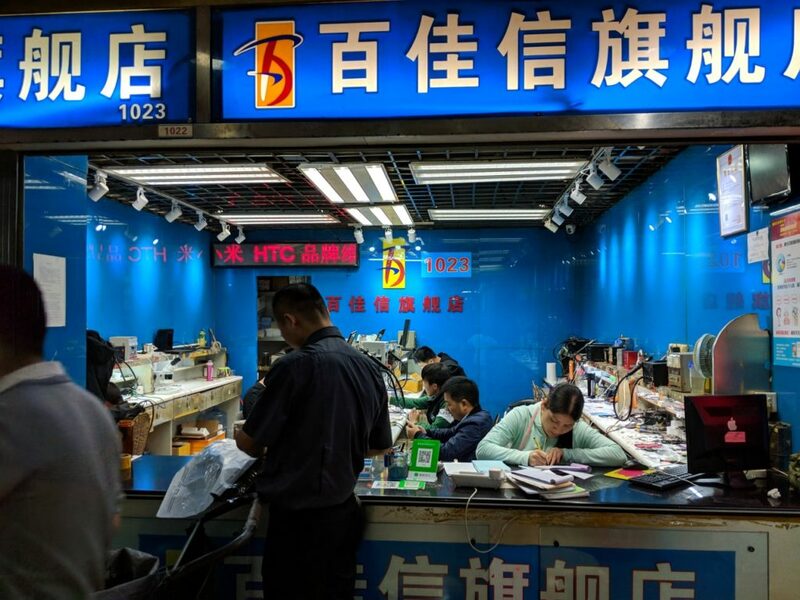 Many of the shops that I did see in HQB were focused on a few things in wholesale: smartphones, decorative smartphone cases, smartphone rings that adhere to the back of your smartphone that you can loop your finger through, and smartphone repair. 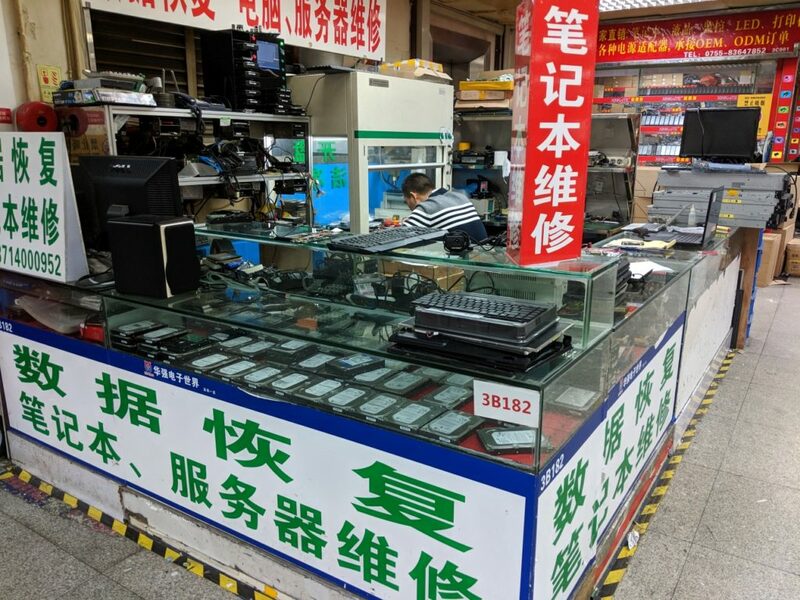 It seems the closest thing to the former Shanzhai phones that are available on the market these days are the numerous knockoff smartwatches, as documented by the guys at keyboardio. 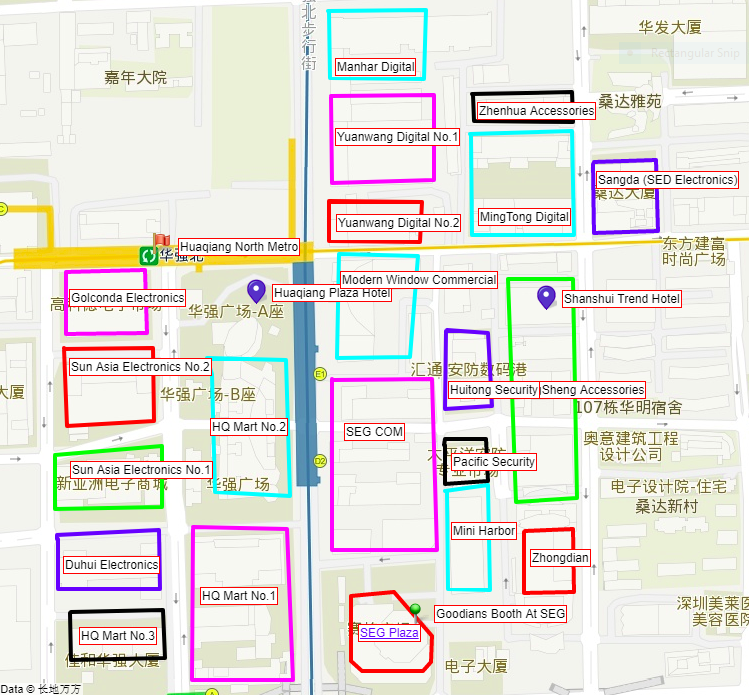 But it really wasn’t clear to me who was doing a lot of hacking on open electronics in these markets anymore. This is unfortunate, and I see it as a regression, if the number of hardware hackers with marketable goods has gone down. 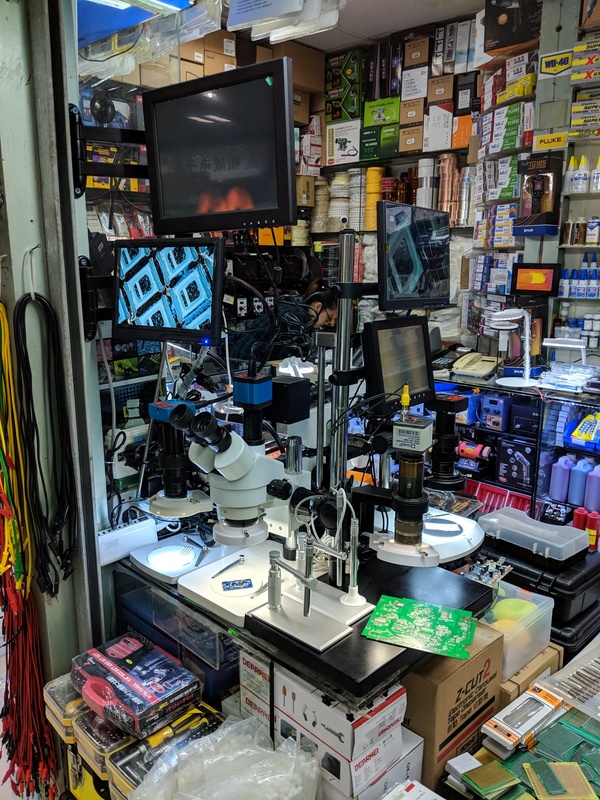 One of the few parts of the overall HQB area that I found very interesting, was the consumer-facing smartphone repair shops, where rows of incredibly-skilled technicians would perform board-level surgery. 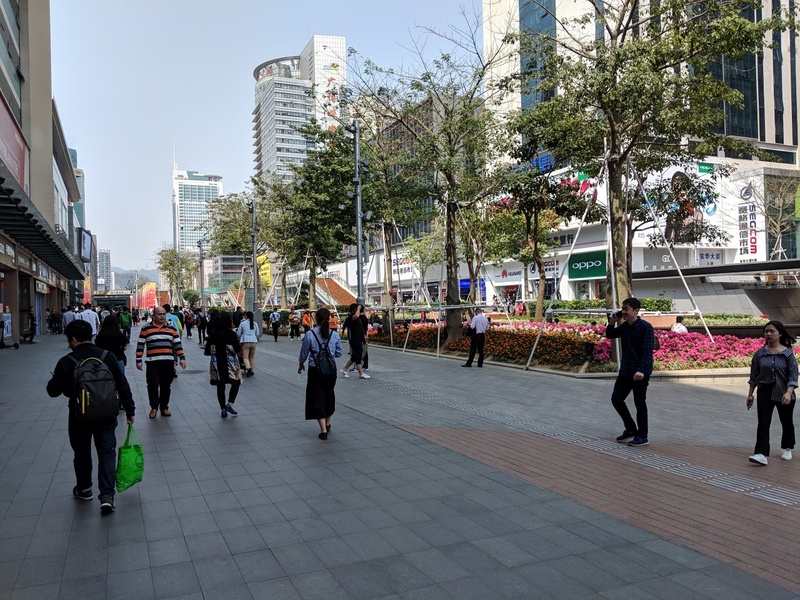 I’ve never seen so many people working with such low-level component exchange in a pedestrian setting. But it gives me some inspiration that so much is possible in terms of PCB assembly, given a limited set of tools and persistence. 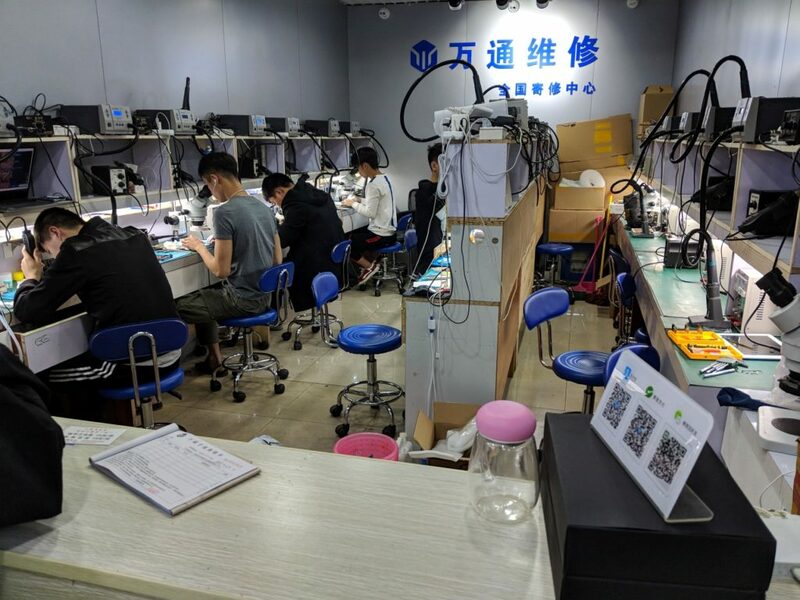 I mean, I work with a guy who actually finds it mildly meditative to solder down 0402-sized components on his first PCB prototypes, but these smartphone techs were a whole other species. A very-well tuned species. 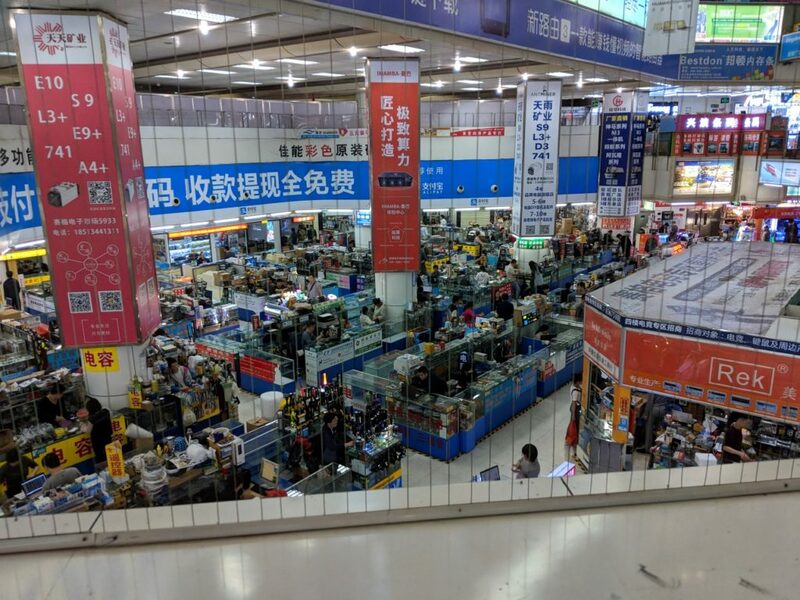 The fourth and fifth floors of the HQ Mart in Huaqiangbei host an entire ecosystem of computer recycling booths. Often these booths had an eye toward increasing the value of recycled components through illegitimate means. This I find extremely fascinating. For instance, what is the person doing in this photo? 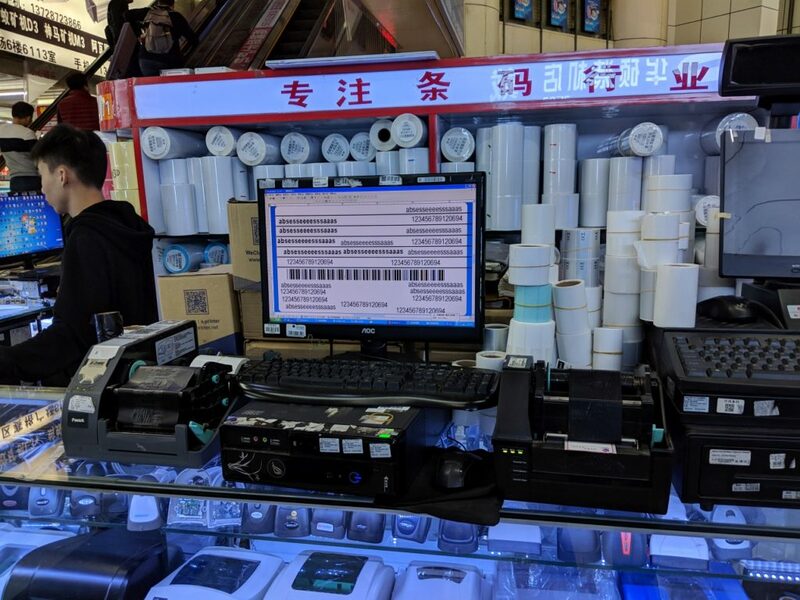 With a label printer and spool of official label blanks, this vendor was relabeling hard drives (probably bringing the manufacturing date forward). 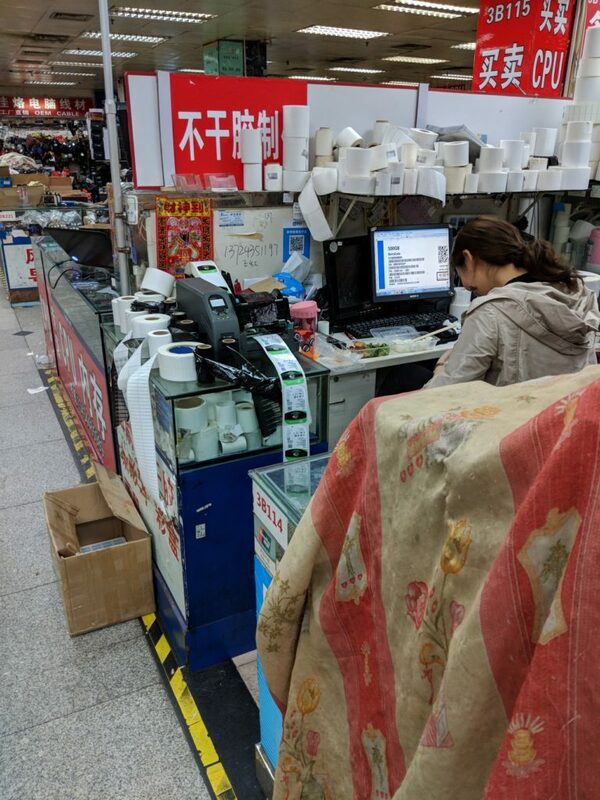 Here’s the story: The lady in the photo had an off-the-shelf label printer and a spool of very official-looking labels for Seagate Barracuda hard disks. 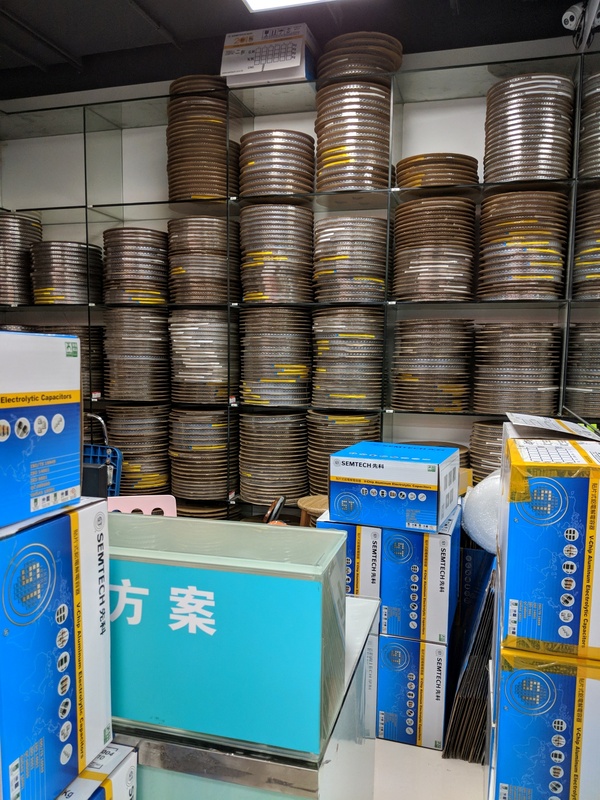 Judging by the stacks of blank labels in the booth, my guess was that the shop specialized in label production and that they were bumping the manufacturing dates forward. Altering the capacity wouldn’t have made sense, as this is easily seen by the user when a computer is running, but who would take a second look into the manufacturing date in the hard disk’s SMART-firmware data? Brilliant. 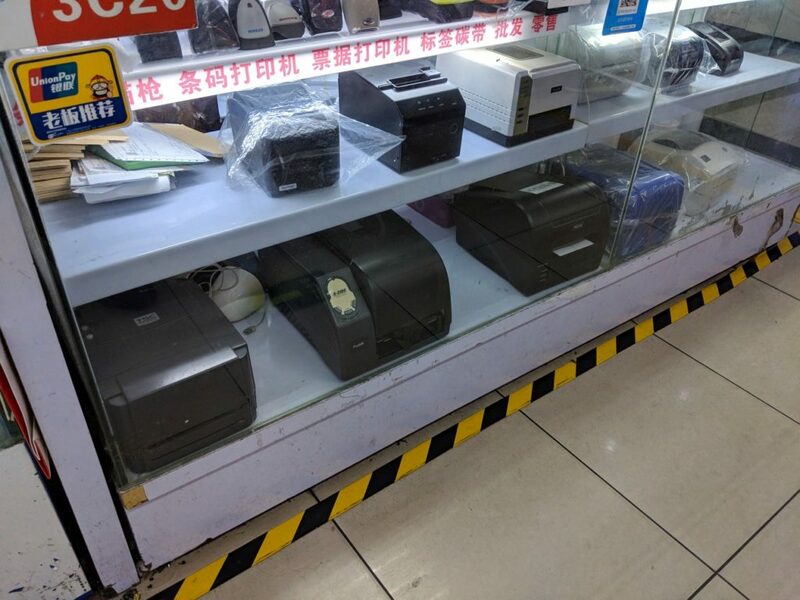 The label printers were built by a Shenzhen-local company called Postek, and there were other vendors within the market who specialized in providing the hardware, software, and supplies for these printers. I’m pretty sure these are also exactly the printers that major component-manufacturers use in official production, given the quality and the fact that the fake labels were in every way as good (minus the misspellings and word transposition issues) as the real deal. 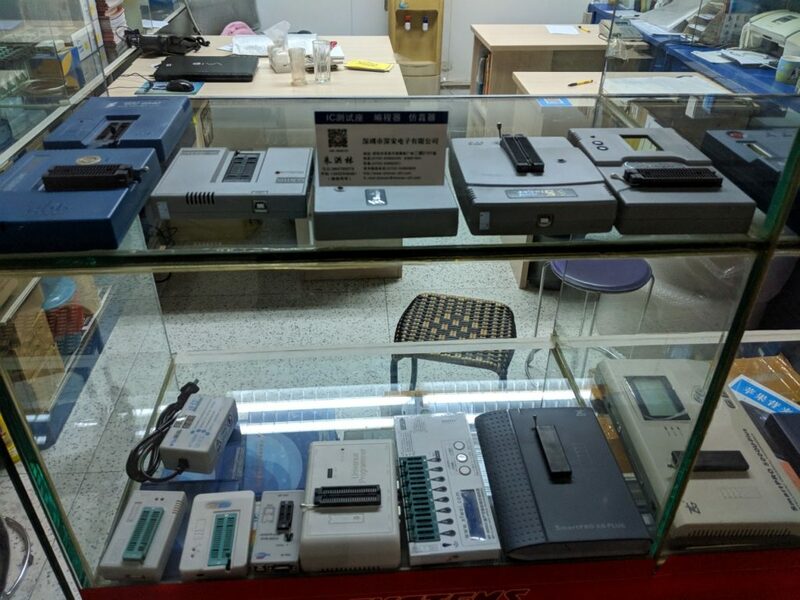 A number of the booths in Huaqiangbei specialized in hard disk recycling and data recovery. This is a genuinely useful service, and it was actually inspiring to see the effort expended in putting marginal hardware to productive use. One machine I noticed that showed up in multiple booths was a multi-bay hard disk scrubbing system. The scrubbing system would go sector-by-sector through each attached hard disk and check whether the sector was capable of storing data or not. When incapable of storing data, the system would mark the sector as bad and then move on. The scrubber would perform these checks across the entire storage surface of the drive, usually writing and reading data on the order of 100MB/second. The LCD display on the system would show an endless stream of #-symbols and occasional X’s, and it was interesting to see the really messed-up drives running through the test. CPU recycling was another specialty of some of the booths. I’m not sure who would want an old Core 2 Duo CPU from the early aughts, or newer 3rd, 4rd, and 5th-generation chips, but they were all there for the purchasing, along with stacks of dubiously-validated RAM. 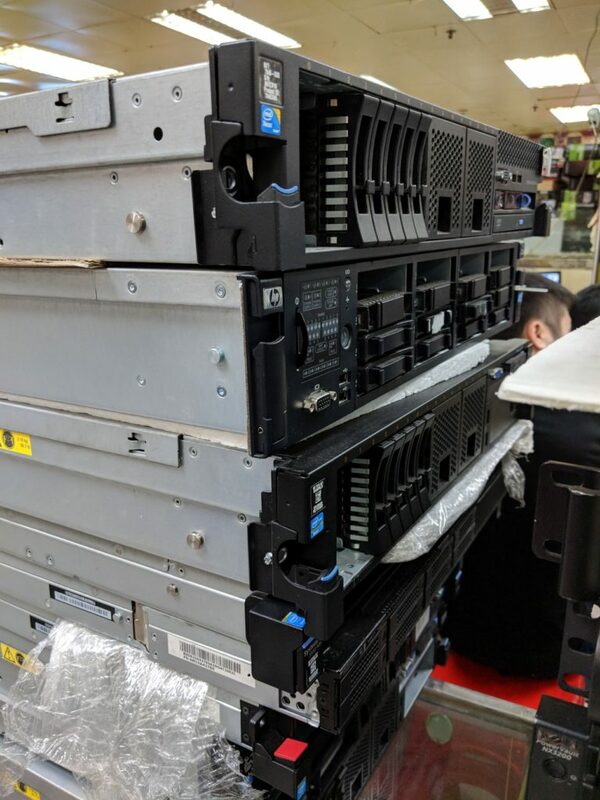 Also available were any number of old off-lease corporate computers, rack-mounted servers, and laptops. What you often noticed about the laptops, though, was just the sort of mish-mash of components that they were assembled from. 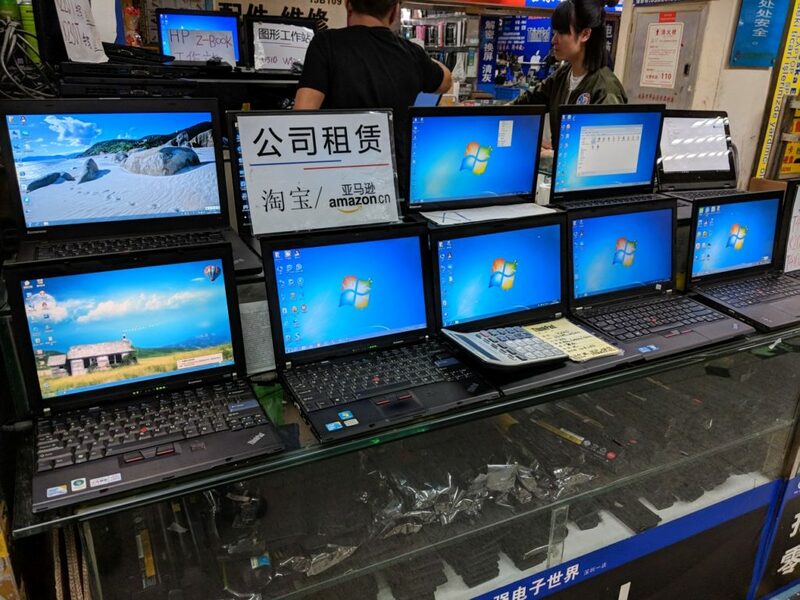 For instance, I was particularly interested in the Thinkpad laptops on sale, since that’s the kind of daily-driver laptop I use. But upon closer inspection, it was easy to see that the available Thinkpads were often missing the camera module, and had keyboards of dubious quality, which had potentially been recapped, and were certainly not of the same level of quality as a genuine Thinkpad keyboard. 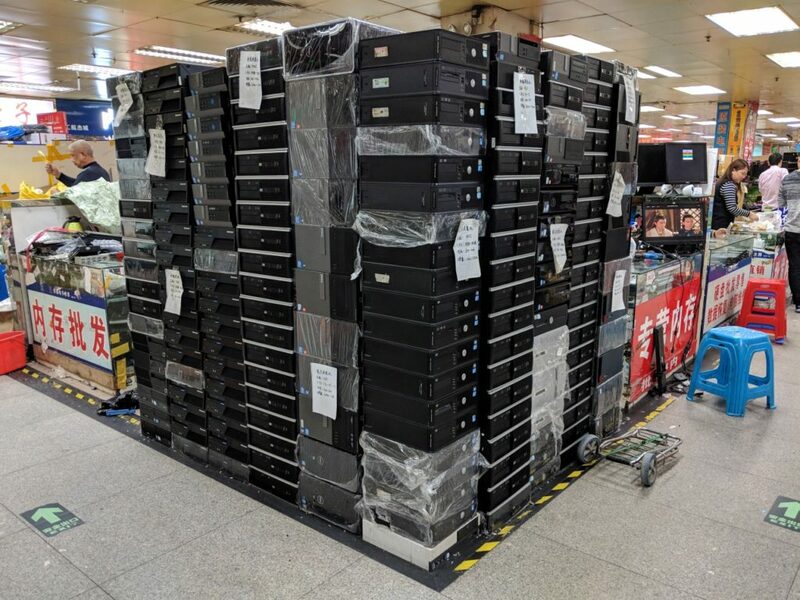 A colleague and I were joking that we estimated the total amount of original components in each of these laptops amounted to probably 60% or less. The same colleague mentioned to me a story about how a friend of his had had computer repair work done at some point, and received his computer back with fewer components than he’d dropped it off with. But that the change was subtle enough that he didn’t notice for months. Of course, this story happened to his friend in Brazil, but point well-enough taken. There were some cosmetic repairs I’d thought about having done to my Thinkpad (previous owner had dropped it a bunch of times). But I thought better of it, and so my working laptop is still all beat to hell with all original parts. 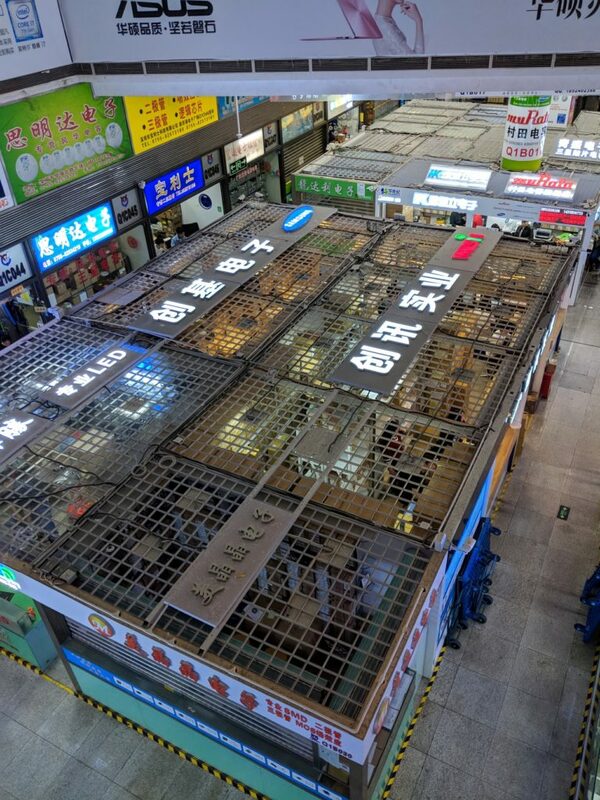 Overall it was an interesting visit, but be prepared to spend well over a day exploring the whole market area. And wear comfortable shoes. 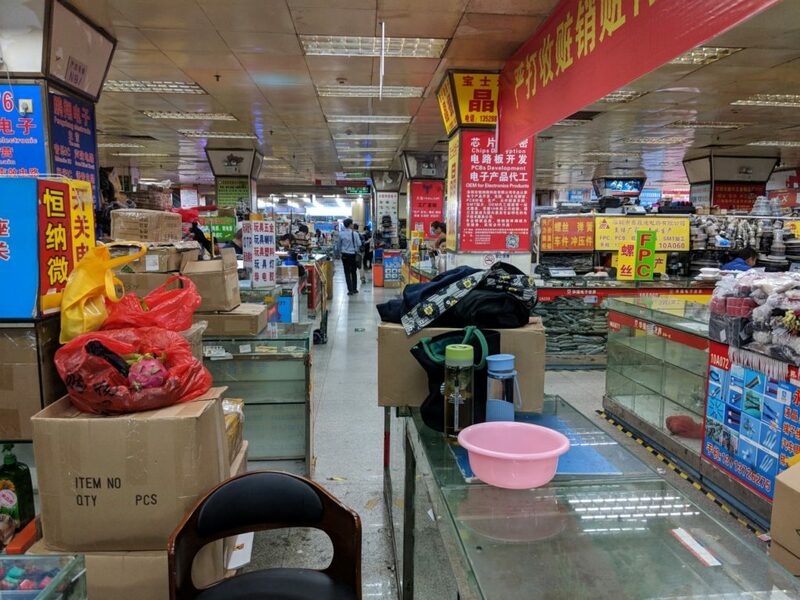 – I still don’t really understand Huaqiangbei Market and am not entirely clear how it fits into Western-style manufacturing, but I’d be really interested to talk to someone who has a deeper understanding of the place. – I’m not sure it’s all that, there’s a reason everyone still sources from the big guys (Digi-Key, Avnet, EBV, and Mouser). – I’m not sure how it actually fits into a Maker’s plans. So, I guess learned nothing from my trip. Enjoy yours, if you ever find yourself on that side of the world with some time to spare! I have the Discovery kit for one of these, but haven’t spent too much time (ok, any time) working with them. The STM8 architecture seems like it’s on the edge of being a casualty to the inexorable march of Cortex-M. For ~20 cents in volume, though, it’s a good bargain, only that the software tooling shows its age a bit. On the point of stolen masks, I wonder if that would be economically viable, at that volume price. For cloned USB-to-serial chips like the FTDIs, it’s a much simpler chip, so it makes sense. I wouldn’t mind, however, getting my hands on something like the http://www.gigadevice.com/products/microcontrollers/gd32/arm-cortex-m3/, which appear to be drop-in feature clones of the STM32F1 series, to see what is under the hood. 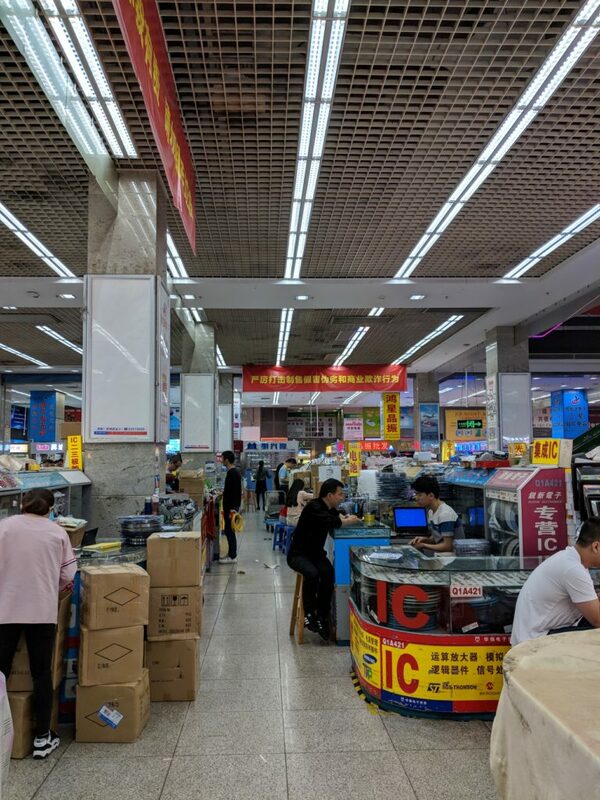 Working with an embedded microcontroller manufacturing company, I have to travel to Shenzhen frequently and myself being an electronics hobbyist, the trip is always a pilgrimage. 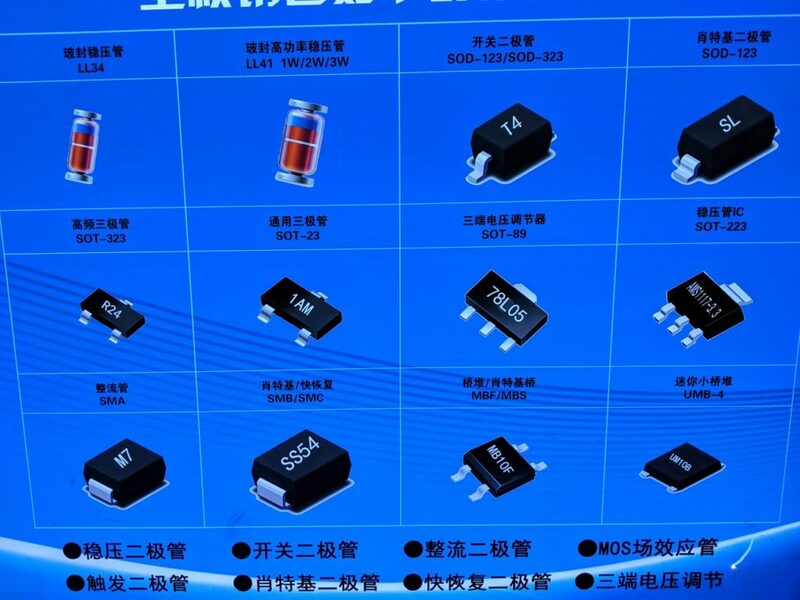 Though I have visited Huaqiangbei every time, I have not been successful in getting more than 12V/2A SMPS. Though I searched for ESP8266 and other modules, such assembled kits are inconspicuous. Almost everytime, I end by purchasing more drones, remote toys, lamps and speakers, which are easier to get.